1. Powerful papaya enzymes break down dead skin cells to help progressively smooth your skin’s surface and uncover a healthy radiant glow. 2. Dermatologist-grade Microderm Crystals at 25%, work to stimulate and exfoliate your skin to help smooth and reduce the appearance of fine lines, scars and blemishes. Many dermatologists use these same crystals for their microdermabrasion treatments. 3. Aloe vera, coconut, panthenol along with a mild cleansing gel keeps your skin hydrated and refreshed and helps soothe the skin during the exfoliation process. I’ve been sparsely using my sample tube three times a week for about a month and am loving the results. My skin feels softer and smoother while also looking brighter and less sallow. It is gentle yet effective and didn’t irritate my irritable skin. Brighten Up! can be found on Vasanti and Glymm for $34 CA. Posted in Beauty and tagged beauty, sample subscription, sensitive skin, skin care. Bookmark the permalink. The March Topbox came in early this week. I’ve been a subscriber for a month but I ‘ve been waiting since November to receive my first box. I love these monthly sample subscriptions, it helps satisfy the beauty junkie within. Topbox costs $10 CA per month and there are usually four samples per box. This month an extra sample was included as a promo. Inside the cylinder were two 10 ml packets each of Redken Color Extend shampoo and conditioner (I don’t colour my hair but I’ll use them anyway), a sample packet of 7 Simple sensitive skin cleansing facial wipes, a 25 ml bottle of Make Up For Ever SensEyes eye cleanser, a full size Mark Gloss Gorgeous Stay On Lip Stain in Frilly (a coral shade), and two 2.7 ml Mark Trend Mini Nail Lacquer in Violet Daze (purple) and Tickled Pink (lilac). 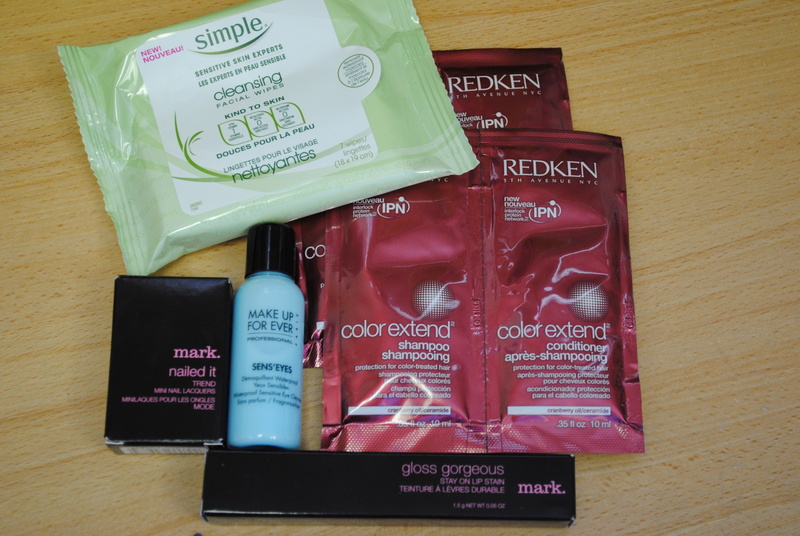 The only miss in this box was the Redken samples, but I’ll probably still use them. I’m lucky, 35 years old and no grey yet. I’m still unsure if I’ll dye my hair when they do come. We’ll have to see. Posted in Beauty and tagged beauty, Cosmetics, Hair care, sample subscription, skin care. Bookmark the permalink. My March Glymm Box came in this week with some pleasant surprises, and one not so pleasant surprise. Glymm is a Canadian sample box company, costing $10 CA for a monthly subscription and $110 CA for a yearly. I’ve been receiving this boxes for three months now, and I look forward to them each month. I’m a product junkie and there isn’t a lot of brands available locally to sample and try.The pink boxes arrive in the mail from across the country mid-month and are well wrapped. I haven’t received any broken items yet. This month the box contained a 1 ml sample of Anastasia Beverly Hills Hydrafull lip gloss in Moi, 5 ml jar of M. Asam Magic Fini skin cream, a full size bottle of Ocean nail polish in Lite My Fire, a sample vial of Lise Watier Flash Lift Radiance, and a Nu Me feather hair extension in magenta. Also included was a coupon for Glymm.com: buy any 2 Anastasia Beverly Hills products and get a free Hydrafull lip gloss and free shipping. I am pleased and eager to try everything except the feathers. I will ship the feathers at my cost to the first person who claims them in the comments (any country is welcome). Leave your e-mail address and I will contact you and get your mailing address. 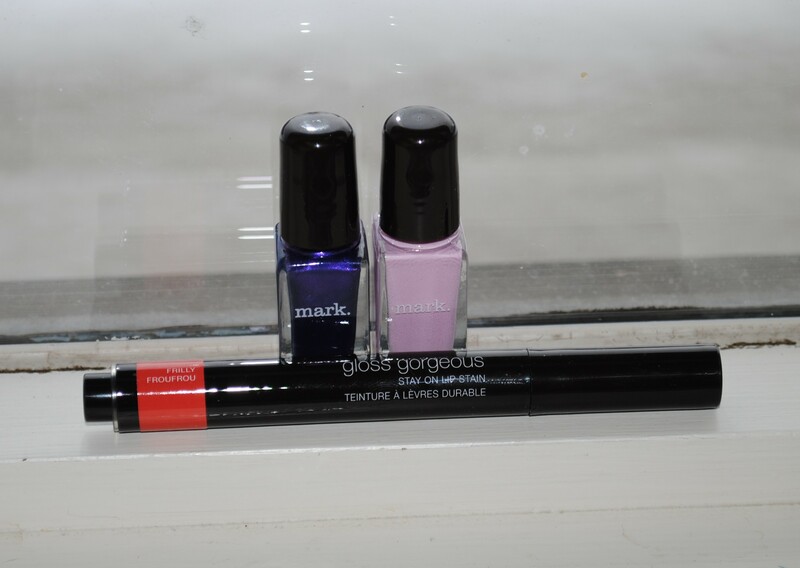 Posted in Beauty and tagged beauty, Cosmetics, sample subscription, skin care. Bookmark the permalink. Simply Ageless Corrector :: CoverGirl. I have severe dark circles under my eyes, regardless of how rested I am. This is because of my eye shape and they are hereditary. Lately I have been using this CoverGirl corrector under my eyes beneath the CoverGirl Ageless Concealer. This product comes in a pot and is yellow with a creamy swirl of Olay in it. I’m not very impressed with this and I am trying to use it up before I replace it with another. A little of this does go a long way, but it can sink in fine lines and it does bubble a bit, leaving little spheres of pigment under my eyes. I normally prime beneath my eye are with the Loreal Magic Perfection Base, which does help a little. Even with the swirl of cream in the corrector, it can feel a bit dry. I will not repurchase this. Any suggestions on a replacement? Posted in Beauty and tagged beauty, Cosmetics, skin care. Bookmark the permalink. Marcelle Makeup and Skincare Blog. As a moisturizer, it delivered as promised. My oily sensitive skin didn’t freak out in blemishes and a rash and the moisturizer was adequate and non-greasy. It soothed and calmed, with no burning when applied. As for controlling shine, it performed well, keeping the greasies at bay and helping my Revlon Colourstay foundation do its job. I notice that after a week of use, my face does feel softer and less red. On the negative side of the coin, the coverage was not opaque enough to cover my imperfections. I have mild to moderate acne scars on my face and severe dark circles under my eyes that the BB cream covered slightly, but not close to enough. I have been using this a primer and layering on green and yellow corrector in spots, topped with a concealer. The last layer is my foundation, which I apply in a medium layer all over my face with additional layers in my problem areas. Surprisingly enough, it all seems natural even in daylight. All in all, I am happy with the Marcelle BB cream. I will probably replace my current GOSH primer with this one and continue using it in the morning with the Burt’s Bees Sensitive Daily Moisturizing Cream. Posted in Beauty and tagged beauty, sensitive skin, skin care. Bookmark the permalink. BzzAgent is the leading word-of-mouth marketing (WOM) company. I joined http://www.bzzagent.com/ a couple of years ago. It’s an innovative website where members sign up for campaigns and receive products to sample, share, and “bzz” about. After sharing with people about Bzz Agent and the product, you go to the website and report what you said and how people received it. The more you share, the better your odds on getting into more campaigns. Bzz Agent also accepts “bzz” from Facebook and Twitter. I enjoy the interactions and products I’ve received, and I’ve been able to test out many new products. Bzz Agent recently changed the structure of successfully moving up the ranks, and it looks promising. I signed up for the Burt’s Bees Natural Skins Solutions for Sensitive Skin campaign last week, and I am looking forward to receiving my bzz kit in the mail. This line offers a daily cream, night cream, cleanser, and eye cream. I’ll post more when it arrives. Posted in Beauty and tagged beauty, bzz, sensitive skin, skin care. Bookmark the permalink.